Variations Within Species And Grades: Great variety of color and figure within species, as well as variation in color among boards, especially in lower grades and from material that isn't steamed prior to kiln-drying. Hardness/Janka: 1010; 22% softer than Northern red oak. Dimensional Stability: Excellent (change coefficient .00274; 26% more stable than red oak). Durability: Moderately dense, very strong, good shock resistance. Not as dent-resistant as oak. Sawing/Machining: Easily worked with hand tools, and has excellent machining qualities. Nailing: Fair resistance to splitting; good holding ability. 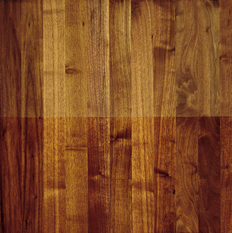 Finishing: Finishes nicely, with a handsome grain pattern. Comments: Distinctive sweet aroma when worked. Frequently used as a highlight material for borders or other inlay techniques. Moderately available, normally in unfinished parquet, strip and in various plank widths as a special order. Available in fancy parquet patterns as a special order or custom mill.